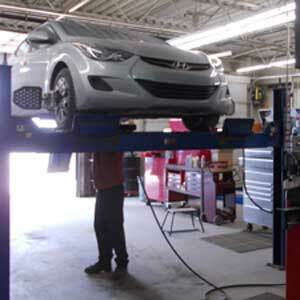 Whether you need scheduled maintenance or emergency repairs, Jerry’s J&L Frame Alignment and Automotive can help. 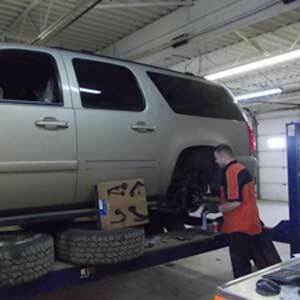 We offer many services for all makes and models. Our shop uses up to date Hawkeye computerized alignment systems to get your wheels lined up perfectly. Suspension is the system of tires, tire air, springs, shock absorbers and linkages that connects a vehicle to its wheels and allows relative motion between the two. Suspension systems serve a dual purpose- contributing to the vehicle’s roadholding/handling and braking for good active safety and driving pleasure, and keeping vehicle occupants comfortable and a ride quality reasonably well isolated from road noise, bumps, and vibrations, etc. These goals are generally at odds, so the tuning of suspensions involves finding the right compromise. It is important for the suspension to keep the road wheel in contact with the road surface as much as possible, because all the road or ground forces acting on the vehicle do so through the contact patches of the tires. The suspension also protects the vehicle itself and any cargo or luggage from damage and wear. The design of front and rear suspension of a car may be different.